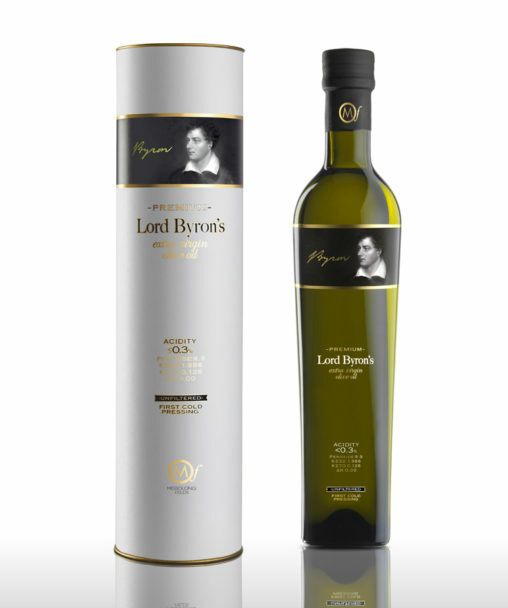 Lord Byron’s™ premium extra virgin olive oil! Olive oil connoisseurs know that not all extra virgin olive oils are alike. Our Lord Byron’s™ premium extra virgin olive oil is produced from hand-picked, mainly Koroneiki olives, milled soon after harvest and stored in airtight containers until ready for bottling. Finally, the oil is minimally filtered, resulting in a very high quality extra virgin olive oil, with extremely low acidity. With Lord Byron’s™ premium unfiltered extra virgin olive oil, the nutritional values of freshly pressed olive oil are retained at their highest possible levels. Fruity and aromatic, just two tablespoons a day are enough to get all the healthy benefits. The world-famous poet Lord Byron is closely associated with Messolongi, which is why we chose to name our premium extra virgin olive oil in his honour.